Whirlybird was shot in the face and is permanently blind. Here, he sleeps at The Marine Mammal Center in Sausalito, CA. Why are so many California sea lions intentionally hurt - more than other marine mammals? “The answer is found in the numbers, individual species’ behaviors, and in what marine scientists directly observe,” said Dr. Bill Van Bonn, director of veterinary science at The Marine Mammal Center. “There are approximately 250,000 California sea lions found along the west coast of California. This far outnumbers all other pinnipeds and marine mammals, combined, including elephant seals, harbor seals, Northern fur seals, and sea otters.”“Another reason sea lions appear to be the more common target of ‘intentional, negative human interaction,’ is that sea lions will more often try to come ashore when gravely injured, while other marine mammal species will die or suffer at sea,” added Dr. Van Bonn. This adult male California sea lion named Sgt. Nevis, was rescued by The Marine Mammal Center in 2009. He had been shot in the head and the bullet severely damaged his nasal passage. The U.S. Marine Mammal Protection Act (MMPA) protects all marine mammals, including cetaceans (whales, dolphins, and porpoises), pinnipeds (seals and sea lions), sirenians (manatees and dugongs), sea otters, and polar bears within the waters of the United States. The Act makes it illegal to "take" marine mammals without a permit. This means people may not harass, feed, hunt, capture, collect, or kill any marine mammal or part of a marine mammal. The Act also formalized the marine mammal health and stranding response program to improve the response of stranding and unusual mortality events. The National Oceanic Atmospheric Administration (NOAA) website gives the complete text of the Act. Silent Knight makes the ninth marine mammal the Center rescued in 2010 with gunshot wounds. Silent Knight rests comfortably in his pool at The Marine Mammal Center. The tissue around his right eye that he lost as a result of a gunshot is beginning to heal. In 2009, 19 sea lions were rescued suffering from gunshots. Sadly, those are only the seals and sea lions the Center knows about and it is most likely that countless others that don't strand on a beach just die at sea. “Unfortunately, our latest gunshot wounded patient, Silent Knight, is only the latest in a long line of marine mammal gunshot patients rescued by The Marine Mammal Center,” said Dr. Jeff Boehm, executive director at The Marine Mammal Center. “In 1992 we began keeping records on human interactions with marine mammals and since then, volunteers and staff have rescued nearly 500 marine mammals (primarily sea lions) that had been shot. We even came to the rescue of a poor sea lion that had been shot in the neck with an arrow from a crossbow." Another gunshot victim that was treated at the Center was Sgt. Nevis was shot in the Sacramento River. How Does The Marine Mammal Center Fit Into Research on Gunshot Violence? 1999 - Goldstein, T., Johnson, S.P., Phillips, A.V., Hanni, K., Fauquier, D.A., and Gulland, F.M.D. 1999. Human-related injuries observed in live stranded pinnipeds along the central California coast 1986-1998. Aquatic Mammals 25(1): 43-51. 2009 - Dau, B.K., Gilardi, K.V.K., Gulland, F.M., Higgins, A., Holcomb, J.B., St.Leger, J. and Ziccardi, M.H. 2009. Fishing gear-related injury in California marine wildlife. Journal of Wildlife Diseases. 45(2): 355-362. 2010 - Jacobsen, J.K., Massey, L., and Gulland, F. 2010. Fatal ingestion of floating marine debris by two sperm whales (Physeter macrocephalus). Marine Pollution Bulletin 60:765-767. Join the Silent Knight Fan Page! Support Silent Knight and spread the word! For one year, you or your loved one will receive a series of different marine mammal adoptees, complete with their biography and color picture (12 total). 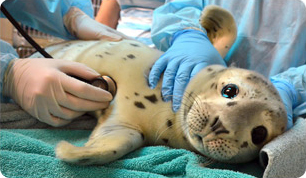 Click here to join the Adopt-a-Seal® of the Month club today! Major annual donors, membership features an opportunity to attend a private release. Two adult cardholders and up to four guests. Find out how many patients are at The Marine Mammal Center right now and how many different species are on-site!